It all starts with Virginia Hanlon, a young woman who got bullied for believing in Santa Claus as a kid (which, yeah, is pretty relatable). So as an adult, she builds a robot Santa to make the world a happier place (which is…less relatable). Unfortunately, some of the robot parts she used belonged to an old Ultron model, so when Robot Santa comes online, the first thing he does is fly off to kill the Avengers. Meanwhile, the Avengers are having their annual holiday party. As much as I like a good action scene, one thing I love in comics is seeing heroes just hang out, and the Avengers holiday party delivers. Whether it’s Spider-Man geeking out over finally having been invited, everyone cooing over how cute Jessica Jones and Luke Cage’s baby is, or Black Panther setting up decorations for Wakanda’s traditional holiday festival, the party is full of fun little character moments. Though I could do without Iron Man giving the mistletoe robot legs so it constantly goes over Spider-Woman’s head and forces her to kiss him. Not cool, Tony. Anyway, Santron comes down the chimney and attacks everyone. 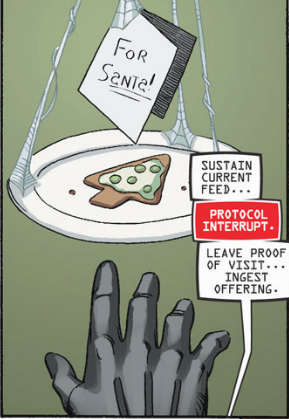 There’s a big fight, and then Spider-Man saves the day by distracting Santron with a cookie. I won’t go into details. The fight scene isn’t important–like I said, this comic is about the fun character moments, ridiculous premise, and Christmas spirit. Besides, you should read it for yourself. At the end, Virginia is understandably upset her Santa tried to go on a murder spree, when–surprise!–the Avengers show up with Christmas decorations and food to throw her an impromptu holiday party. Spider-Man tries and fails to give her a pep talk, and then he does what we would all do and shoves Captain America forward to give a speech about the meaning of Christmas. Wolverine isn’t crying, you guys. He’s just got some dust in his eye. 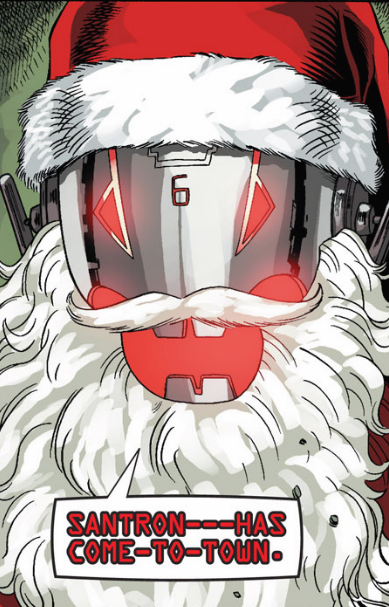 From the Marvel Holiday Special 2005, “Yes Virginia, There is a Santron” is a fun little story and one of my favorite Christmas specials. If you’re feeling stressed out this holiday season, you should cheer yourself up by giving it a read. You can grab a digital copy for less than two bucks, and it comes with two other holiday stories (though Santron alone is worth two dollars, easy). So, to everyone who celebrates, I hope your holiday season is filled with joy, time with loved ones, and absolutely no killer robots.